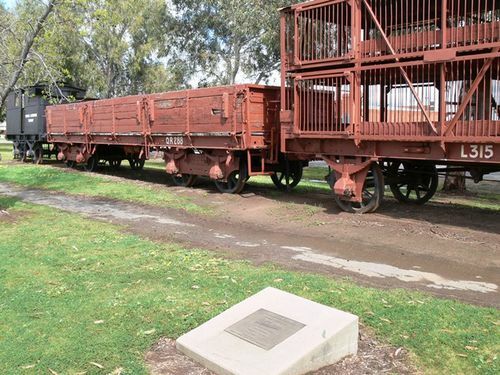 A plaque commemorates the centenary of the opening of the Koondrook to Kerang Tramway which was held in 1989. The Kerang–Koondrook Tramway was an Australian private railway of 5 ft 3 in (1,600 mm) broad gauge running from the state-owned Victorian Railways network at Kerang to the Murray River town of Koondrook, with intermediate stations at Yeoburn, Hinksons, Teal Point and Gannawarra. Construction of the 13.94 mi (22.43 km) long line was initiated by the Shire of Swan Hill in 1887, under the terms of the Tramways in Country Districts Act 1886, which allowed local governments in country areas to construct tramways, with financial assistance from the Victorian government, to a limit of £2,000 a mile. The tramway was opened in 1889. Barham & District Services Memorial Club Limited.